Properties in Mountain View Marina average 4.7 out of 5 stars. Lakeside Base for Adventure with All the Comforts of Home! Views! Decks! WiFi! Property 6: Lakeside Base for Adventure with All the Comforts of Home! Views! Decks! WiFi! Lake Front Lodge with Amazing Lake and Mountain Views....Close to Blue Ridge!!! Property 11: Lake Front Lodge with Amazing Lake and Mountain Views....Close to Blue Ridge!!! Property 21: Privacy Directly On Fires Creek. Borders National Forest And Bear Refuge! Mountain Views! Bedding for 8! Game Room & Wet Bar! Weekly & Military Discounts! Property 27: Mountain Views! Bedding for 8! Game Room & Wet Bar! Weekly & Military Discounts! Property 28: LOCATED 15 MINUTES FROM DOWNTOWN BLUE RIDGE! Secluded Starr Mountain get away near the Hiwassee, Ocoee & Tellico rivers! Property 30: Secluded Starr Mountain get away near the Hiwassee, Ocoee & Tellico rivers! Morganton Area - Less Than 20 Minutes From Downtown Blue Ridge! Property 33: Morganton Area - Less Than 20 Minutes From Downtown Blue Ridge! Newly Renovated! Breathtaking Mountain/Water Views! Pool. Trails. Near Casino! Property 40: Newly Renovated! Breathtaking Mountain/Water Views! Pool. Trails. Near Casino! Featured on HGTV's "Log Cabin Living" - The Cedar Shack :: Book Today! Property 41: Featured on HGTV's "Log Cabin Living" - The Cedar Shack :: Book Today! 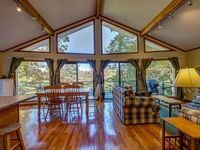 Property 45: Awesome Mountain View with hottub, wifi, and more! Property 46: Mountain Views FOR MILES! Located Directly On The Toccoa River! Property 47: Located Directly On The Toccoa River! Property 50: LOCATED IN MINERAL BLUFF, GA. 15 MINUTES FROM DOWNTOWN BLUE RIDGE! Views, proximity to town, clean comfortable! Everything you could ask for! We had a wonderful family vacation! It was peaceful, comfortable and clean. Lots for kids to do! The cabin was clean and comfortable. We didn't have to go out to eat.....home cooked meals are the best! And we loved the memory foam matress, very good sleeping. God answered our prayers again! It couldn't have been any better for the price. Thank you VRBO!